Sunday, October 20th. 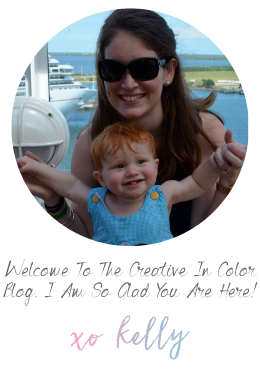 First day at sea. Days at sea are so fun because you can sleep in, relax, and enjoy everything there is to do on the boat. The first thing we did this morning was give Perry a bottle out on our own personal verandah. So lovely. After a slow-paced breakfast, we went to "Wake up with Disney Junior" - a time for preschoolers and their parents to sing and dance to Disney Junior songs along with some cast members and disney characters. This morning, Goofy came to play. Perry enjoyed watching the other kids dance and listening to the music from the safety of our arms. After Disney Junior time, we ran into Daisy and stopped for an autograph and photo op. Lines for characters were not too bad most of the time (except for Jack Sparrow....his lines were crazy), and we only got in them if they didn't look too long. There were multiple times to see each character during the week (often multiple times per day). Then Andrew and Perry rested while I got a haircut in the spa onboard. I had been meaning to get one before we left, but there is just not enough time in the day for that. So it was perfect to get it done while we had time off and Andrew could keep little-bit. Yeah all those pictures were taking during warm ups. During the actual "heat" Perry didn't really move. He sat and looked at all the people watching and yelling and pretty much just basked in all the attention. Haha. Maybe he has less of a competitive spirit than his mother. We will see. 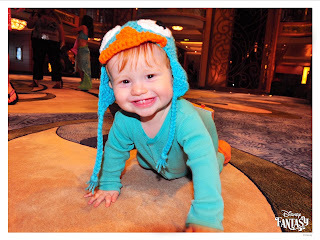 Regardless, he won a Disney Cruise Line bib for participating which is far more functional than the plastic mickey medal you get if you win. 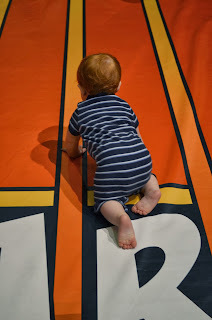 And it was fun to meet all the other families with little crawlers. 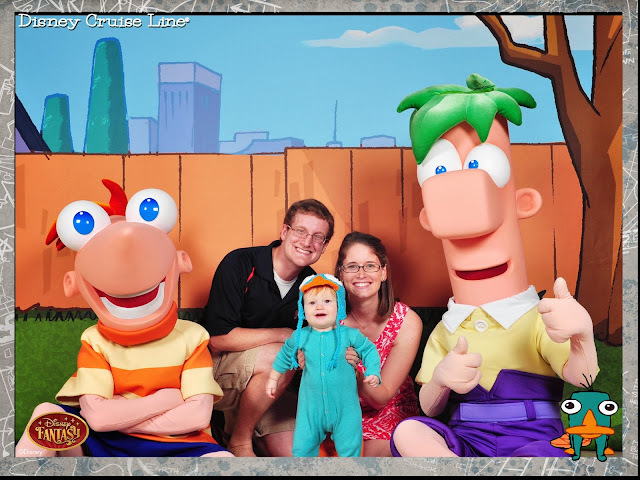 The highlight of the day was getting to meet Phineas and Ferb. The characters from the cartoon called not-surprisingly "Phineas and Ferb" who have a pet platypus named Perry. 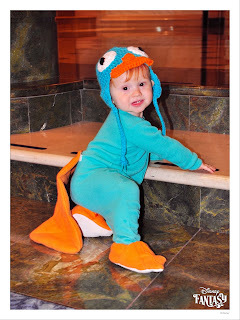 We decided a long time ago that Perry would be the platypus for Halloween and so we were super excited to dress him up in his costume to go meet his cartoon owners. 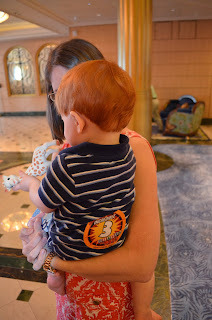 While we waited in line, Perry and I hung out in one of the big cushioned porthole windows. Are those pictures with Phineas and Ferb not the most precious things (I know there are a bunch...but I love the progression? Such a sweet memory. Notice those last two pictures of just Perry? 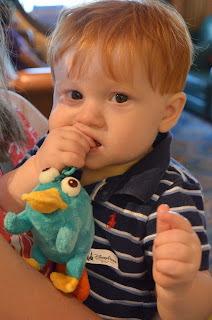 One of the photographers fell in love with Perry when he saw him getting his pictures made with Phineas and Ferb and asked us to wait around in the atrium until he got done with his session, after which he came over and spent about 5-10 minutes following our baby around taking pictures of him. It was very sweet of him (totally unsolicited and off the clock) to do and several of the pictures turned out really cute! 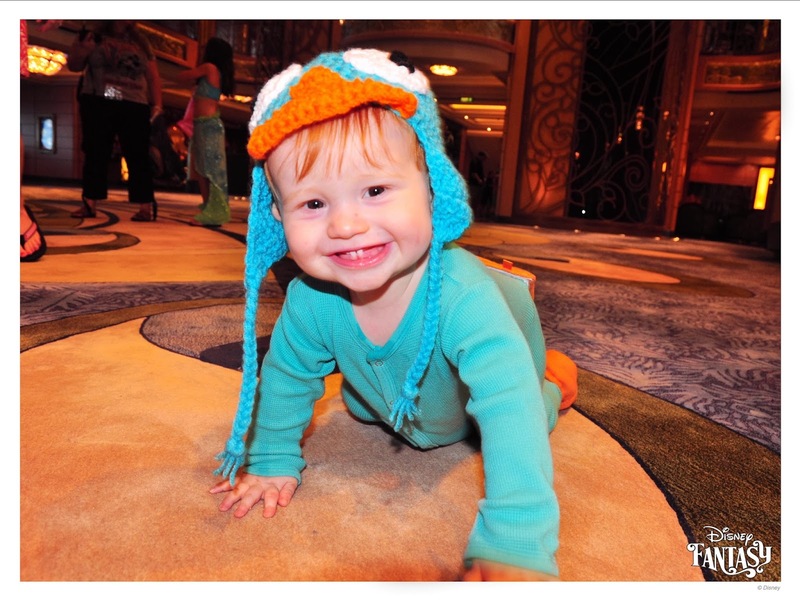 P got quite the reputation for his costume and for the rest of the trip lots of the cast members would refer to him as "Perry the platypus." 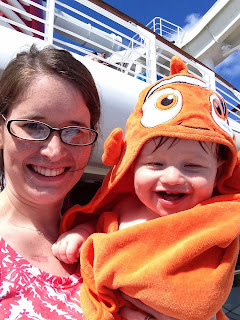 We spent a few minutes exploring "Nemo's Reef" in the afternoon - the water play area for diaper babies. It had a soft floor for crawling around, and best of all - was completely covered so there was no need for sunscreen or the fear of sunburn. 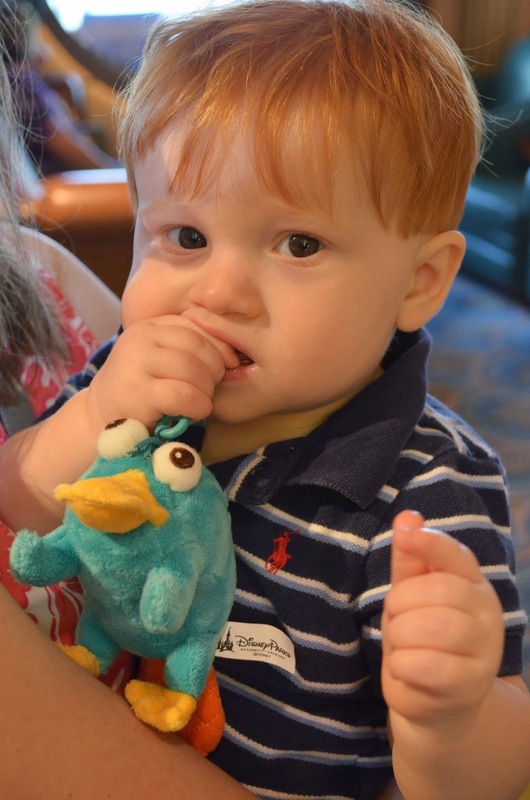 Perry loved it. I think one of the things that surprised me most about Perry this trip was how much he loved the splash areas...absolutely no fear of the water...and was totally ok with it spraying him in the face or falling on his head. He smiled and laughed the whole time he was in there. Dinner was in Enchanted Garden on night two, it was a really cool restaurant that made you feel like you were dining in a garden outside. The lighting and art on the walls transition through the meal from daytime to dusk and the lights are shaped like flowers that slowly open and shut. This was formal night. One of my favorite things about cruising is the expectation to dress for dinner. I love dresses and wear them pretty much all the time on cruises (even when I could get away with capris and a blouse). There is a 7-8 year old version of myself that wore nothing but athletic shorts and t-shirts who would have a fit to hear me say that today. But we had a great time getting all gussied up and going first to meet-up with friends in one of the adult areas (while P was playing in the nursery) then on to dinner. 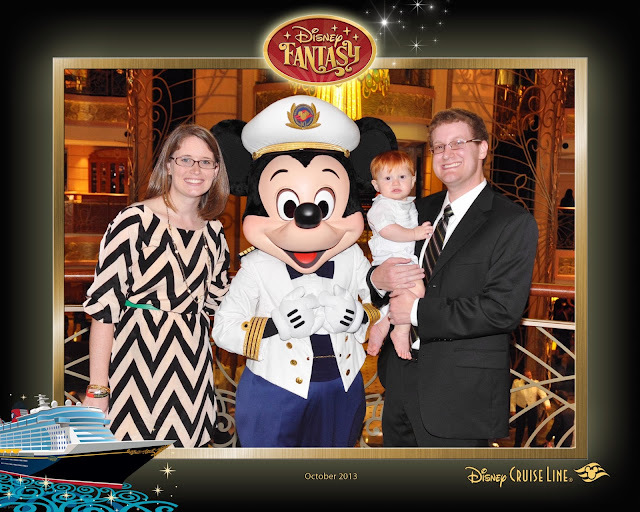 We met up with Mickey Mouse on the way from picking up Perry and heading to dinner. 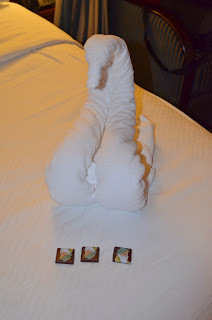 When we got back to our room we had our beds turned down, a towel folded into a swan and chocolates appropriately donned with Sleepy the dwarf.